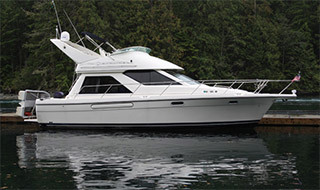 One Way Charters - charter between Anacortes and Desolation Sound, Port Hardy or SE Alaska. IMAGINE taking a yacht to a faraway destination, then flying home and seeing an amazing view of the San Juan & Gulf Islands & Desolation Sound from the air! You could spend your precious vacation time and dollars exploring those northern reaches, and never have to backtrack to the point of departure. What's the best way to enjoy a cruise to those far away destinations? 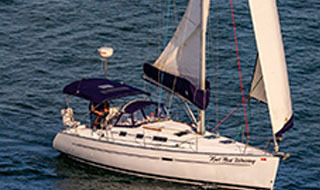 ANACORTES YACHT CHARTERS offers a unique opportunity. During the spring or fall, a select group of our yacht owners will allow you to charter between Anacortes and Desolation Sound, Port Hardy/Pt. McNeill or SE Alaska. Become one of the lucky few to reserve a vessel for the trip of a lifetime. **Please keep in mind that most One Way trips originate at our charter base in Anacortes, WA. unless advertised otherwise. All One-Way charters within AYC's stated cruising grounds to the 51st parallel (Port Hardy/Port McNeill area) are based on current Seasonal Rates. Required Minimums: Vancouver, BC or Desolation Sound - 10 days; Port Hardy - 2 weeks; SE Alaska - 4 weeks. Drop fees apply to all One Way charters to & from Vancouver/Desolation Sound and Port Hardy/Pt McNeill areas to cover additional 'turn' fees that will be incurred. (The fee for vessels to Desolation Sound up to 49' is $1000., and for 50' plus is $1500. For Port Hardy, to 49' $1500., 50'+ is $2000.) An additional Insurance Refundable Damage Deposit applies to any charter that travels north of Port Hardy. PLEASE NOTE: Standard Cancellation terms do not apply. Due to scheduling and marketing return trips, more stringent payment and cancellation terms apply: If booked 121+ days prior 50% is due at booking, and 30% of that is immediately non-refundable. At 120 days prior the entire balance is due, and is immediately non-refundable. Also, if another client or the vessel owner and/or his guests have made ticket arrangements or booked vacation dates for the return trip prior to 120 days, there will be no refund for any reason, as they have based their vacation plans on your charter commitment. Policies can differ slightly by boat as per agreement with boat owner. Owners may from time to time offer special deals on a One Way trip to match their vacation dates! 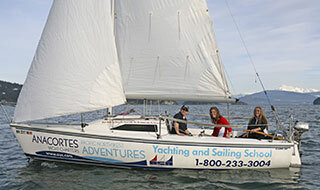 AYC will assess your Boating Background Resume, and make suggestions to help you prepare for a fantastic voyage! The yacht owner's insurance underwriter reserves the right to approve all resumes. Review available boats here, then contact our Reservations Team Manager for further details. 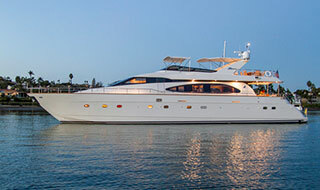 We currently have 13 yachts available for one way charter. Take your friends and family on a REAL adventure, to places they've never been before. This 4 stateroom luxury sailboat is ready for the trip of a lifetime! If you drop off in Campbell River or Port Hardy, and the owner is able to book a congruous ONE WAY trip back to Anacortes, he will waive the One Way fee. Call for details!